Raise your hands! How many of you love bugs? If you had asked that question at the Bohart Museum of Entomology open house at the seventh annual Biodiversity Museum Day last Saturday at the University of California, Davis, the Yellow Shirts would have been proud. 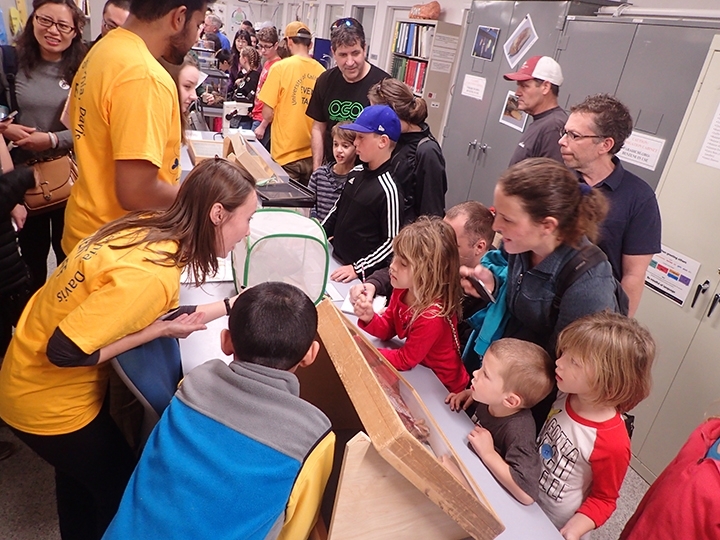 The Yellow Shirts were the volunteers--the insect enthusiasts who share their time, dedication and expertise. Check out the photos and you can see and feel--and almost hear--the excitement. UC Davis student Danny Nguyen coaxing a walking stick to climb his arm. UC Davis student Diego Rivera showing Madagascar hissing cockroaches. UC Davis doctoral candidate Jessica Gillung encouraging questions from an inquisitive group of youngsters and adults. 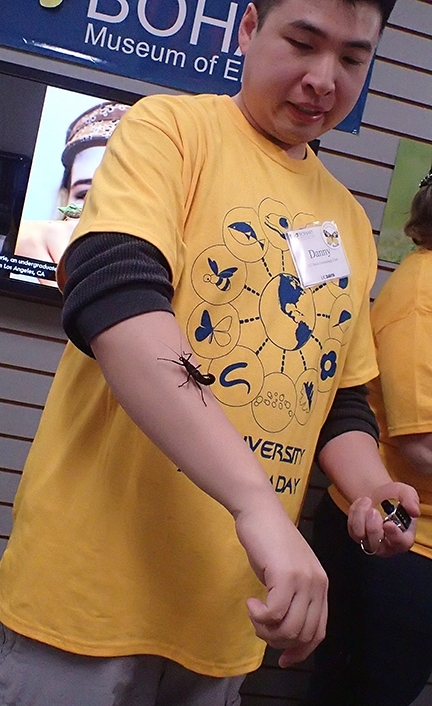 UC Davis entomology graduate Joel Hernandez displaying a walking stick or stick insect. 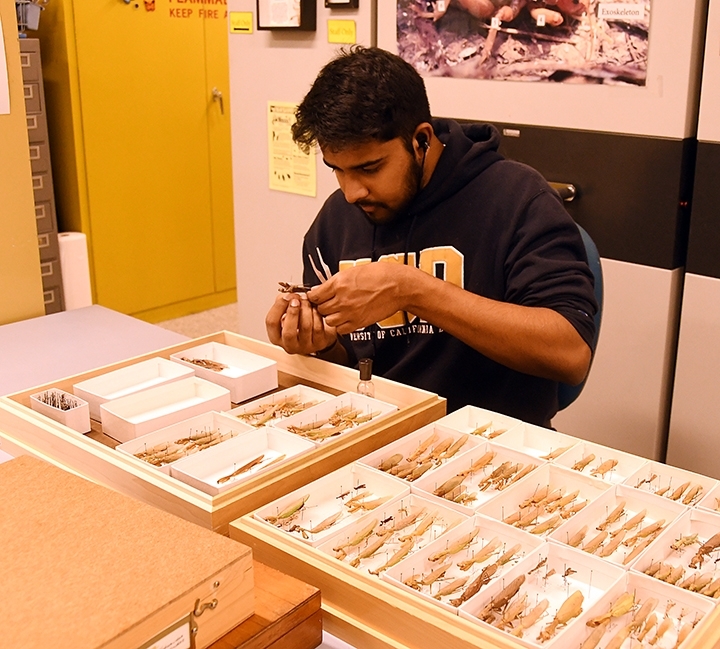 UC Davis entomology student Lohit Garikipati showing his orchid praying mantis and others from his collection. Bohart Museum associate Noah Crockette, Sacramento City College student, discussing his collection trip to Belize, led by faculty members Fran Keller of Folsom Lake College and Dave Wyatt of Sacramento City College. 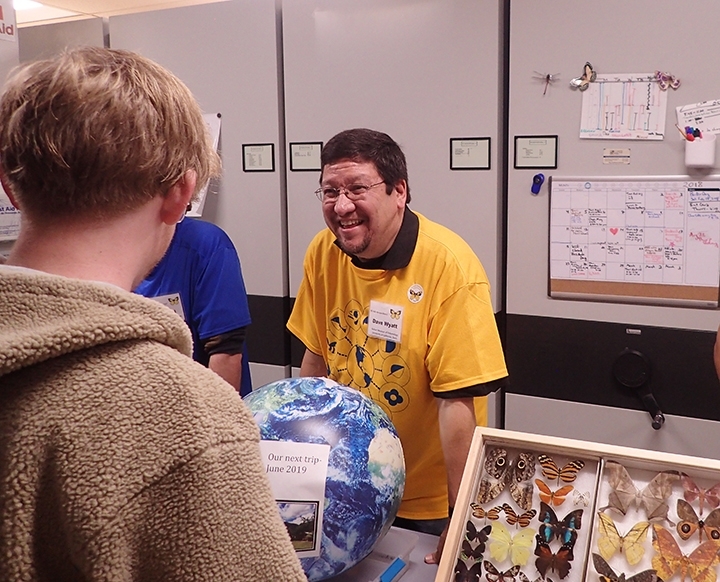 Entomologist Jeff Smith showing the butterfly/moth collection that he curates at the Bohart. Professor Dave Wyatt of Sacramento City College discussing the insects he collected in Belize. The day was still new when someone penned "holding insects" to answer the bulletin-board question, "What do you like best about the exhibits?" Many more comments followed. 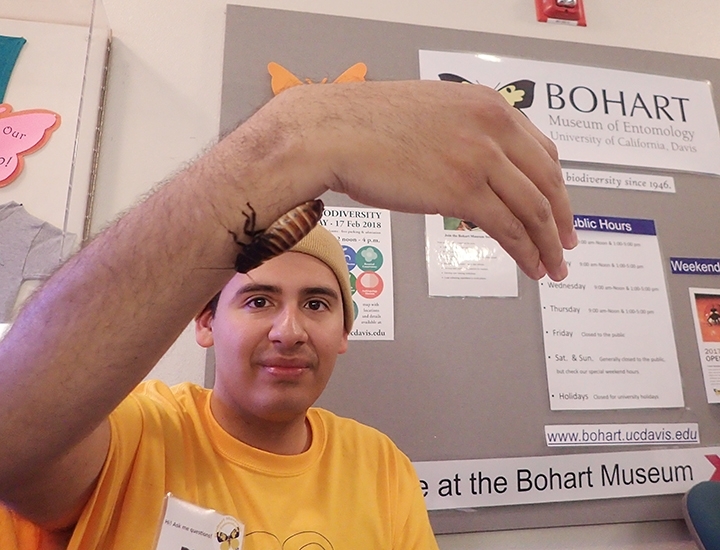 The Bohart Museum, directed by Lynn Kimsey, professor of entomology, is home to some 8 million insect specimens, plus a live "petting zoo" and a gift shop. It's located in Room 1124 of the Academic Surge Building on Crocker Lane. If you missed Biodiversity Museum Day, the next major event is the campuswide UC Davis Picnic Day on Saturday, April 21 when the Bohart Museum and other entities will greet thousands of visitors. And it's free. Meanwhile, the insect museum's regular hours are from 9 a.m. to noon and 1 to 5 p.m. Mondays through Thursdays. Admission is free. For more information, contact the bmuseum@ucdavis.edu or access the website or Facebook page. Most bakers define a "cupcake" as a a small cake designed to serve one person--and one that can be baked in a paper or aluminum cup in a muffin tin. 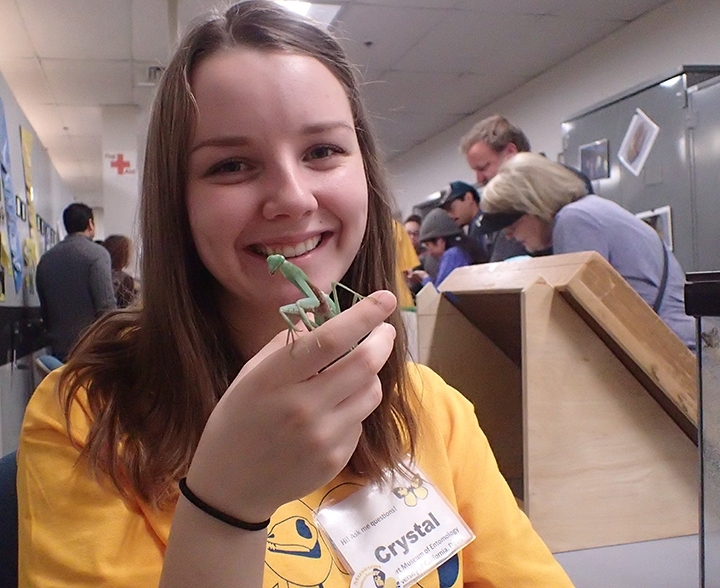 Not UC Davis animal biology major Crystal Homicz, treasurer of the UC Davis Entomology Club. 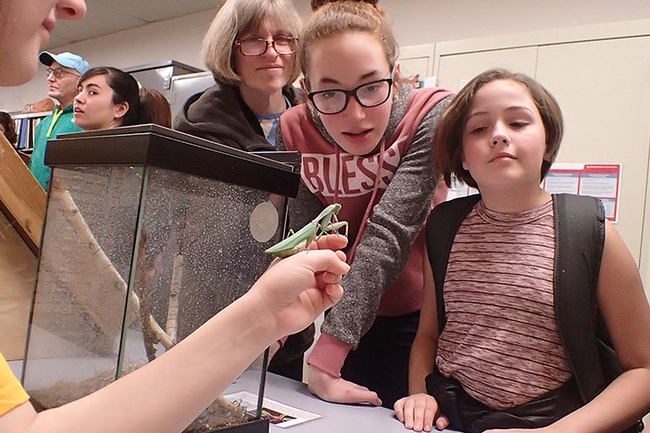 "Cupcake" is the name of her six-month-old praying mantis that she exhibited at the Bohart Museum of Entomology last Saturday during the seventh annual Biodiversity Museum Day. 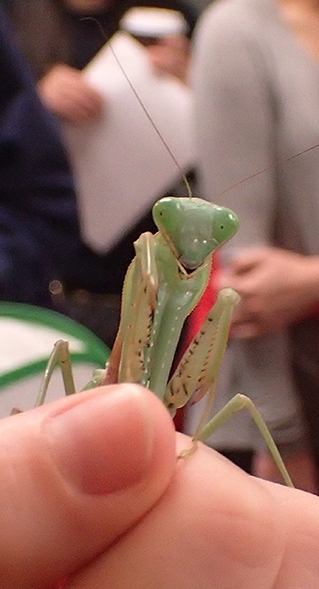 The adult mantis is a Rhombodera megaera, native to southern China and Thailand, Homicz told the crowd. 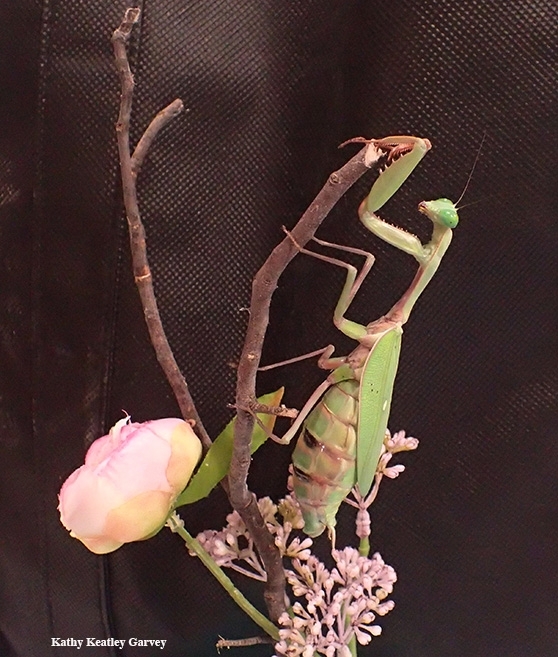 The species is one of the largest mantises in the world; it can reach 4 to 5 inches in length. However, Cupcake is not that large. Homicz, a student researcher in Steve Seybold's forest entomology lab, also has the male of this species and hopes to mate it this week. "I've been feeding her lots of flies so I hope the male doesn't lose his head," she said, referring to sexual cannibalism that can occur. A females can lay about three oothecae (egg cases) in her lifetime. Between 150 to 250 nymphs can hatch from an "ooth." 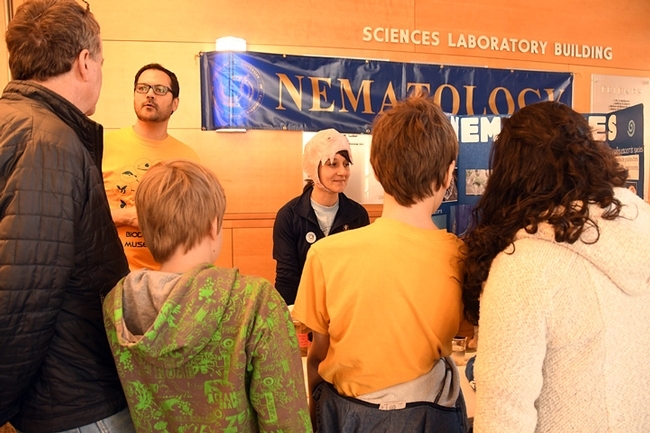 The Biodiversity Museum Day, featuring 13 collections or museums on campus, drew thousands of visitors exploring the diversity of life, said chair Tabatha Yang, education and outreach coordinator for the Bohart Museum of Entomology. Seven were open from 9 a.m. to 1 p.m.: Museum of Wildlife and Fish Biology; Bohart Museum of Entomology, Raptor Center, Paleontology Collection, Arboretum and Public Garden; Phaff Yeast Culture Collection; and the Viticulture and Enology Culture Collection. 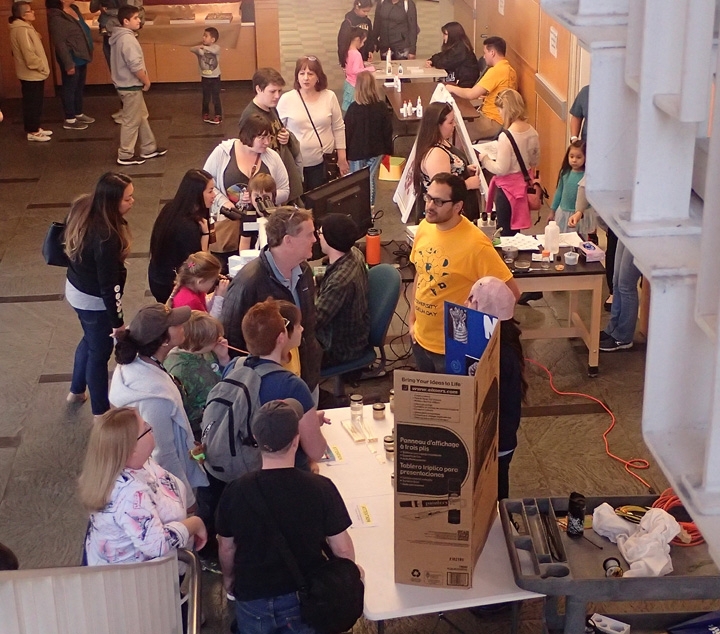 Six were from noon to 4 p.m.: Nematode Collection, Botanical Conservatory, Center for Plant Diversity Herbarium, Anthropology Museum, Häagen-Dazs Honey Bee Haven and the Design Museum. 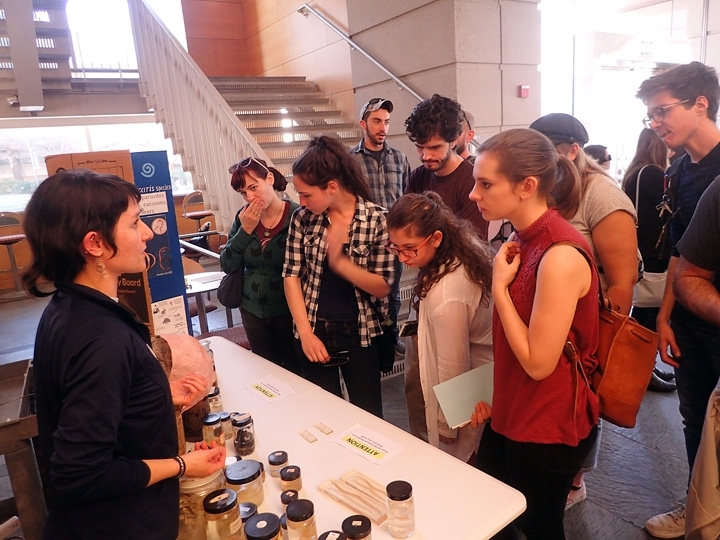 Plans are already underway for the eighth annual Biodiversity Museum Day. The next major campus event is the 104th annual UC Davis Picnic Day, set April 21. "Bugs from Belize in the Bohart." It doesn't get any more bugly than that. That would be the exhibit at the Bohart Museum of Entomology. It's part of the seventh annual Biodiversity Museum Day, an all-day event set from 9 a.m. to 4 p.m., Saturday, Feb. 17 and showcasing 13 museums or collections. And yes, it's all free and open to the public. The following will be open from 9 a.m. to 1 p.m.: Museum of Wildlife and Fish Biology; Bohart Museum of Entomology, Raptor Center, Paleontology Collection, Arboretum and Public Garden; Phaff Yeast Culture Collection; and the Viticulture and Enology Culture Collection. But back to the bugs from Belize in the Bohart. 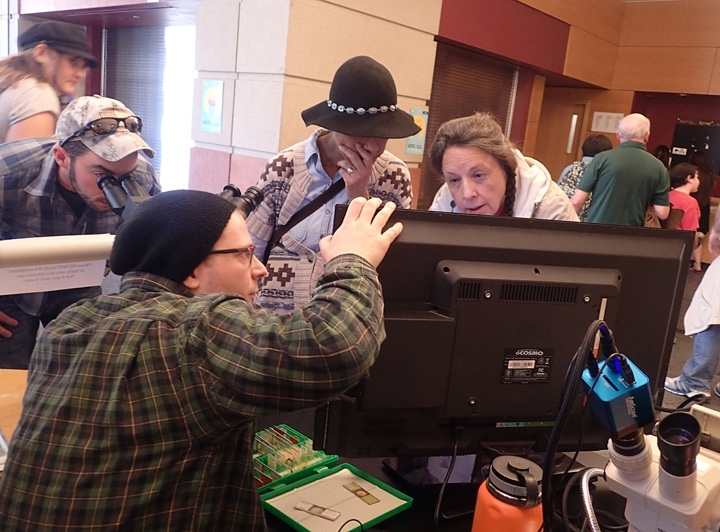 Bohart associates Fran Keller and Dave Wyatt led an expedition there in January--one of many collection trips they've organized--and they'll be at the Bohart from 9 a.m. to 1 p.m. to display the specimens and answer your questions. 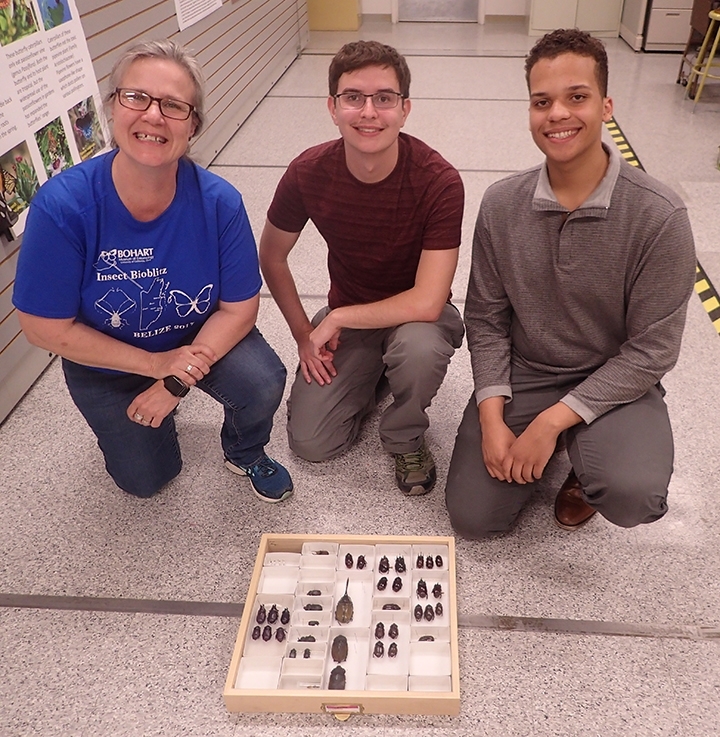 Among those participating on the collection trip were Jeff Smith, who curates the butterfly-moth collection at the Bohart; Darian Dungey, a 2017 UC Davis graduate in entomology; and Noah Crockette of Davis, a Sacramento City College student studying entomology. Wyatt is a biology professor at Sacramento City College, where he teaches courses in the feild ecology programs. 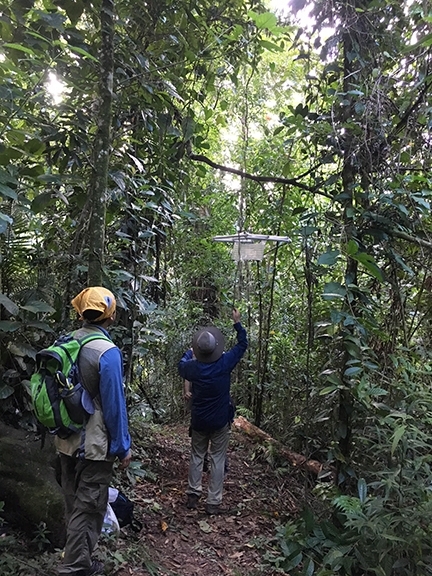 "I am a wildlife biologist with research interests in mammalogy and entomology and I specialize in working with ringtails (a relative of raccoons, coatis, and kinkajous) and bats," he says. "One of my favorite places to travel to is Belize in Central America - I have been fortunate to be able to go to Belize numerous times during the last decade." Keller is an entomologist who teaches biology classes at Folsom Lake College. She holds a doctorate in entomology from UC Davis, where she studied with major professor Lynn Kimsey, director of the Bohart Museum. As a child, Fran was fascinated with insects and spent hours collecting them and observing them. Fascinated? She still is! 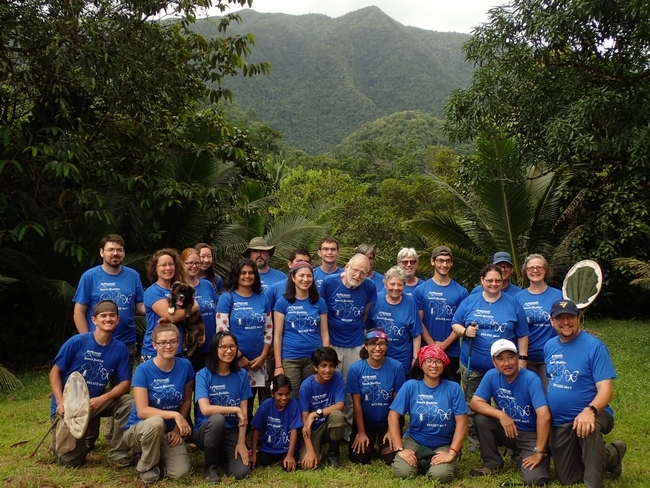 They estimated they brought back 100,000 specimens from their first Bohart Bioblitz Collecting Trip in June 2016. 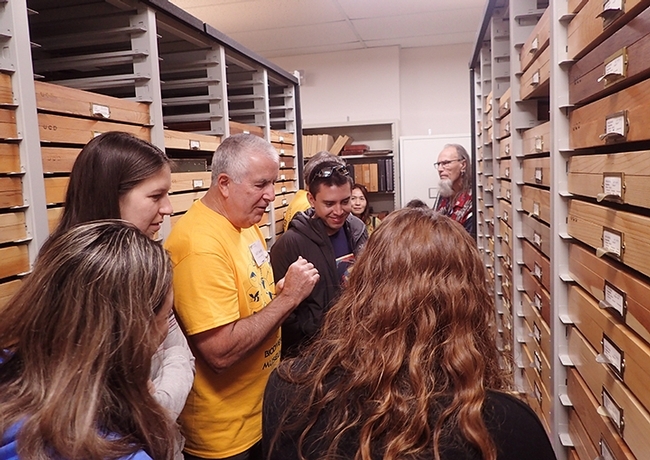 They co-taught a course at Sonoma State for the first two weeks in June and the collecting trip followed. "Our very first collecting trip to start the National Collection was in June 2014," Keller related. "We then went in June 2015, June 2016, August 2017 and January 2018. 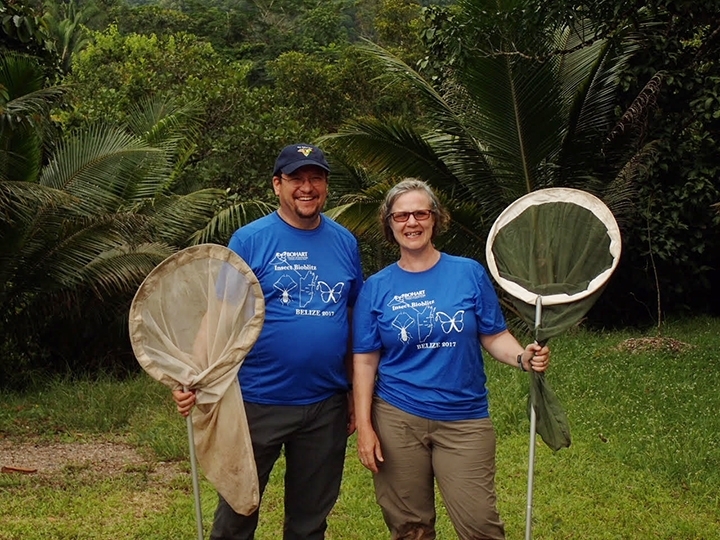 The June 2016 and August 2017 were official Bohart Bioblitz Collecting trips (no course attached) with entomologists and insect-loving students helping collect insects for the Belize National Insect Collection, which is currently housed at the Bohart Museum." 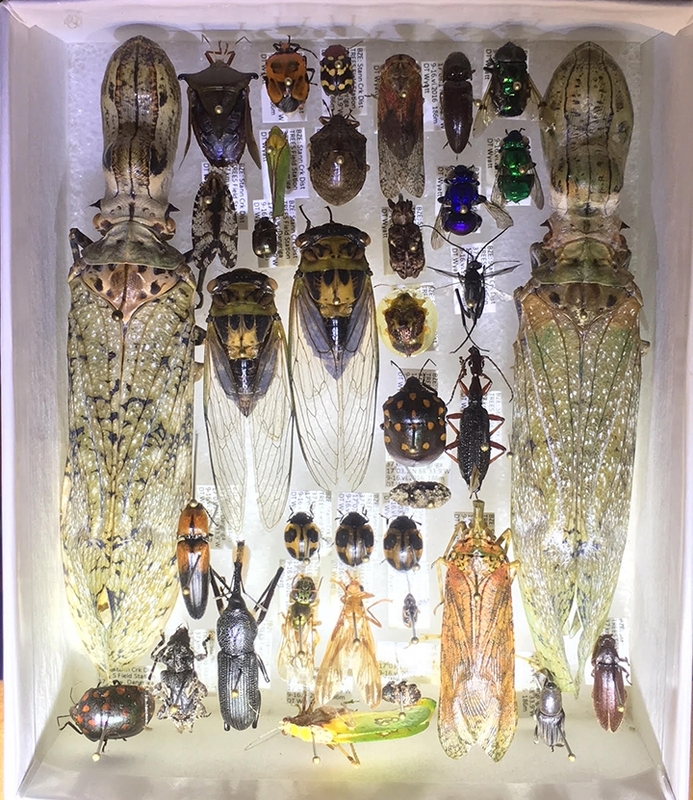 The Bohart Museum is the home of eight million insect specimens, collected globally. 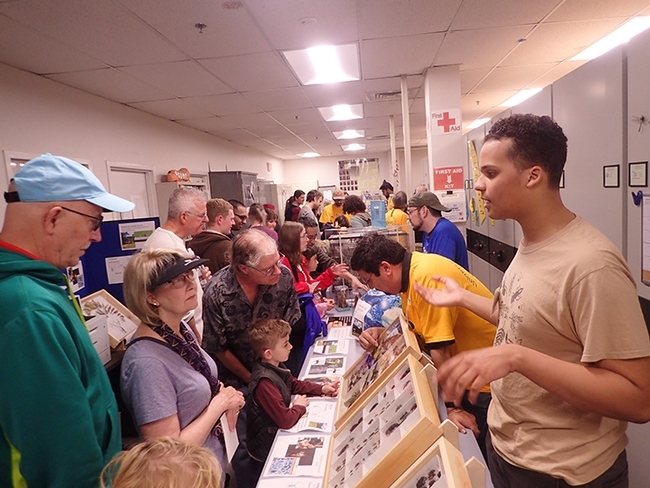 On Saturday, you'll see scores of specimens, plus the live "petting zoo" of Madagascar hissing cockroaches, walking sticks, rose-haired tarantulas, and praying mantises. 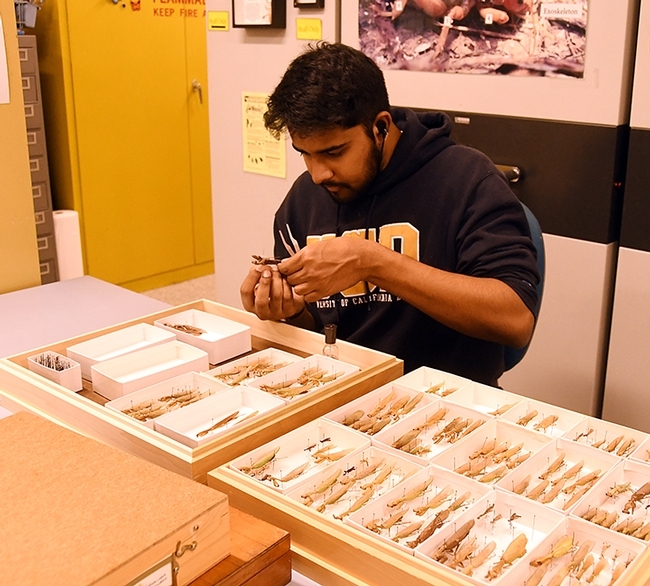 UC Davis entomology student Lohit Garikipati will display his praying mantises, which include an orchid mantis and an Australian rainforest mantis. 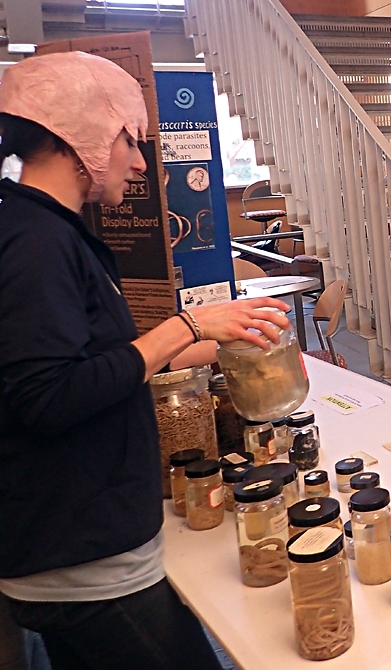 Be sure to check out all the collections and exhibits during Biodiversity Museum Day. The only dilemna is: "What should we see first?" You can download a map on the Biodiversity Museum Day website. All the collections are within walking distance except for the Raptor Center on Old Davis Road and the Häagen-Dazs Honey Bee Haven, a bee garden, on Bee Biology Road. 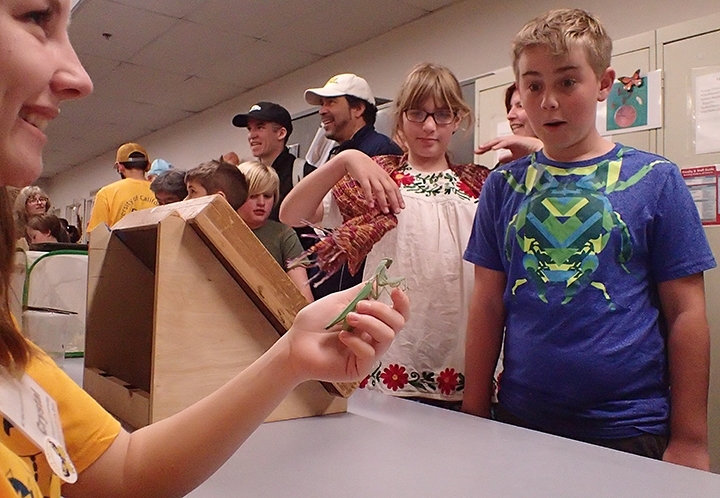 It's all about exploring the diversity of life--from hawks to honey bees, and from dinosaur bones to butterflies. And bugs from Belize at the Bohart. Have you ever said "Hi" to a watermelon? No? Well, you can "meet and greet" a watermelon at the Bohart Museum of Entomology during the seventh annual campuswide Biodiversity Museum Day on Saturday, Feb. 17 at the University of California, Davis. But you can't thump it. 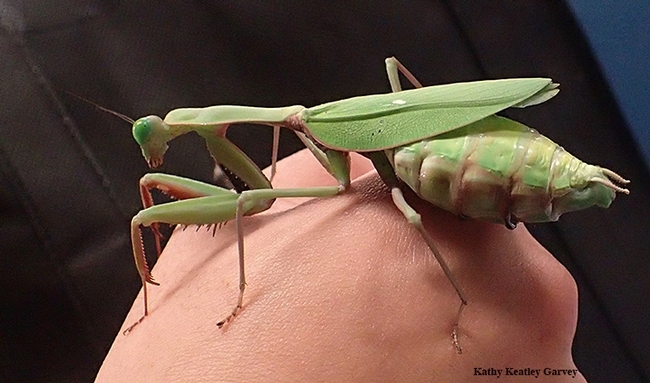 It's a praying mantis nicknamed "Watermelon," so named because of its red and green coloration. The adult female Australian rainforest mantis, Hierodula majuscola, is part of the collection of UC Davis entomology student/Bohart Museum associate Lohit Garikipati. Garikipati will be showing Watermelon and numerous others from his collection--including an orchid mantis named Marsha--from 9 a.m. to 1 p.m. at the Bohart Museum, located in Room 1124 of the Academic Surge Building on Crocker Lane. "Watermelon is actually on the smaller size of her species--wild individuals are more around the 4-5 inch mark, whereas watermelon just passes 3 inches," says Garikipati, who serves as secretary of the UC Davis Entomology Club and is an active member of the Facebook page, Mantis Keepers. "They are incredibly aggressive, both males and females, and females will even regularly eat Extatosoma tiaratum (Australian leaf insects) when they come across them." The Australian rainforest mantises are not only known for their large size and aggressive nature, but "they are very pretty, with black and red on their inner forearms--which they flash in defense when they are threatened, Garikipati points out. 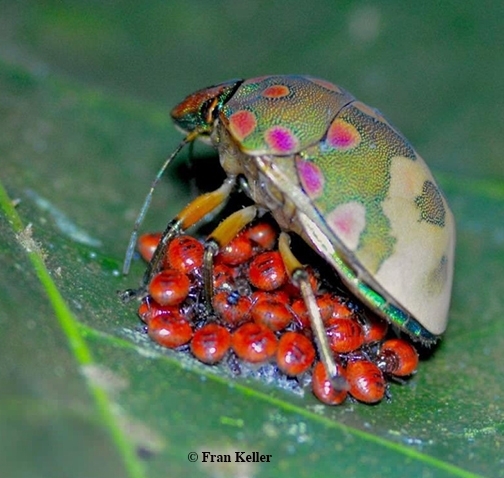 "So far Watermelon has laid two egg cases, "but this species can lay around four, with each ootheca hatching 150 plus nymphs." 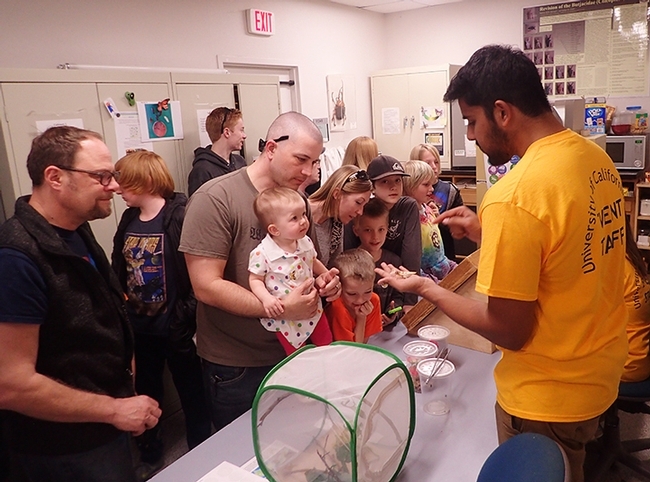 Garikipati presented a detailed seminar on mantises last Friday to fellow scientists at the Bohart Museum during their regular lab meeting. 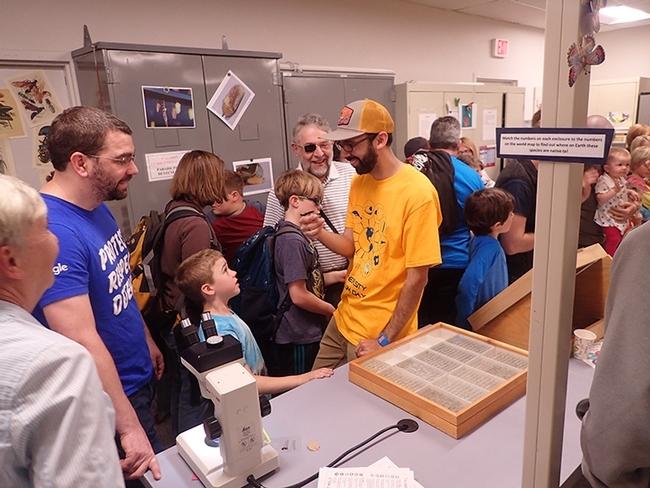 Also at the Bohart Museum on Feb. 17, you can see the butterfly and moth collection, curated by entomologist Jeff Smith; and newly collected specimens from a January field trip to Belize headed by Bohart associate and entomologist Fran Keller, assistant professor at Folsom Lake College; wildlife biologist Dave Wyatt, professor at Sacramento City College; and others on the field trip. No stranger to the Bohart, Keller received her doctorate in entomology from UC Davis, studying with major professor Lynn Kimsey, director of the Bohart. The Bohart Museum is just one of 13 museums or collections to be showcased during the UC Davis Biodiversity Museum Day. The event is free and open to the public. All participating museums and collections have active education and outreach programs, said Biodiversity Museum Day committee chair Tabatha Yang, the Bohart's education and outreach coordinator. The collections are not always accessible to the public. Maps, signs and guides will be available at all the collections, online, and on social media, including Facebook and Twitter, @BioDivDay.